EXCELLENT LOCATION!!! 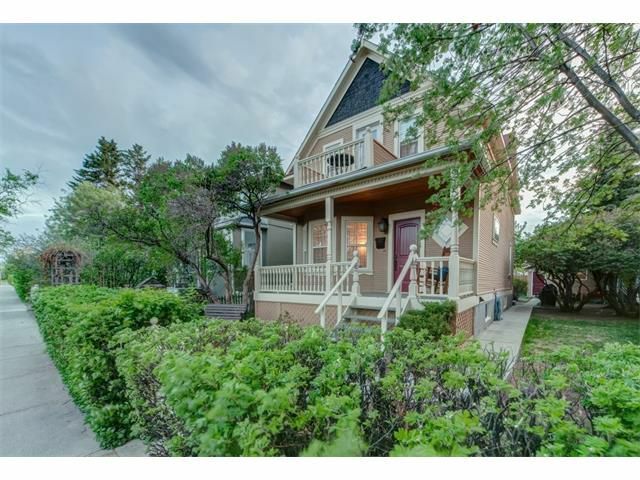 Spectacular Character home in BRIDGELAND creates an ideal inner city lifestyle. JUST 5 MINS TO DOWNTOWN. This STUNNING 2 storey home offers over 1800 sq ft of living space. 2 bdrms up, 1 down, 3 baths, west facing backyard, double detached garage & 2 balconies, all enjoyed in this TRENDY & beautifully appointed property. LUSH TREED LINED STREETS, walking & biking paths along river, great restaurants & an abundance of shops welcome you into the community of Bridgeland. Spacious front porch & lovely stained glass window showcases the bright, sunny foyer. Gleaming hardwood floors, large bay windows & gas fireplace welcome you into the living & dining rms. Chic new kitchen offers new cabinetry w/high end stainless appliances & striking granite counter tops. Large window over sink looks onto a beautifully landscaped west facing, fully fenced backyard, creating an ideal entertaining space. Upper level features LARGE MASTER bdrm w/ SPA-LIKE ENSUITE, walk-in closet -See additional comments! Master also includes an east facing Juliet balcony to enjoy your morning coffee. Second bdrm & LOVELY 3 pc bath w/ DOWNTOWN VIEWS complete this level. Lower area features 3rd bdrm, 3 pc bath, laundry rm & storage rm. A home to truly enjoy, tastefully finished with exquisite tiling, new carpet, new paint & new hardwood. A viewing to impress! !